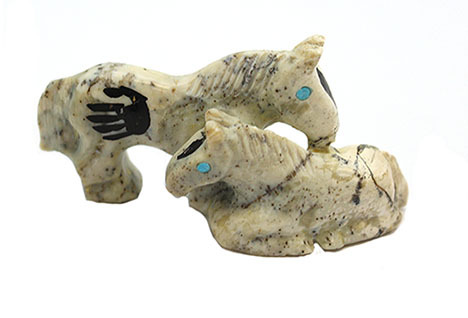 This fetish is carved out serpentine and is of two horse's. One standing that has a cheif hand painted on its back and the other laying down. They both have turquoise dot eyes. It measures 2 1/8" wide, 1" tall by 3/4" thick. It is Navajo hand carved by Carol Martin. Only this one available.